Nautical themed baby showers are alway popular. Hera are a few nautical baby shower invitations in a variety of styles – from clean, sleek and modern to rustic and cutesy – available from Lemon leaf prints. Here you can find invitations with popular design elements such as anchors, sailboats, lighthouses, water and waves. Many of these invitations also has matching items such as flat and folded thank you cards, envelope seals, diaper raffle tickets, decorative stickers, favor tags, mailing labels and more. Some even have matching postage! 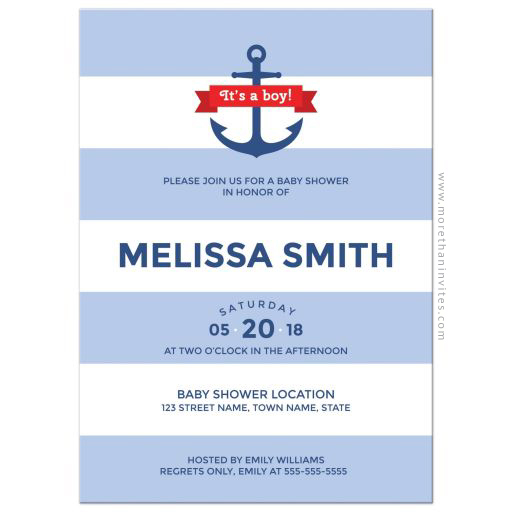 A stylish and modern nautical baby shower invitation with blue stripes and anchor with red ribbon banner and the text “It’s a boy!”. Designed by MheaDesign. Modern Ahoy! 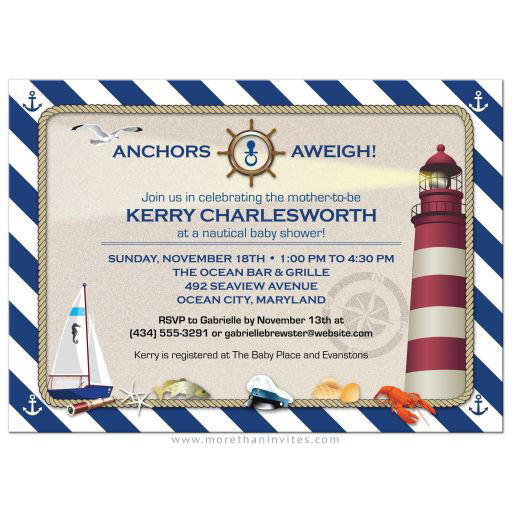 nautical baby shower invitation with blue anchor. This classy baby shower invitation has the word “ahoy” in red letters at the top. Inside the o is a blue anchor. Just below the word is a blue ribbon banner with the mother-to-be’s name and the text “is having a baby’. The rest of the invitation text is dark blue and some is enclosed by a rope border, and at the bottom there is a wave border. The back has blue stripes. Would work well for a nautical themed or an anchor themed / anchors ahoy / Ahoy it’ a boy themed baby shower, or for any boat, sailboat or ship themed baby shower. Designed by MheaDesign. 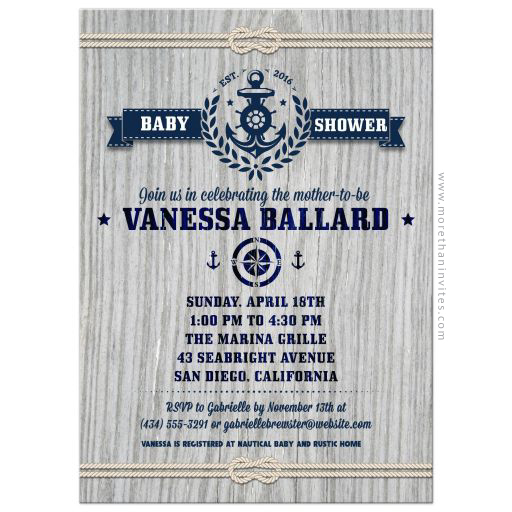 Capped off by the classic nautical elements of an anchor and ship’s wheel, the banner at the top of this invitation announces a unique rustic nautical baby shower. The background is a rustic ocean worn wood with sailor’s rope knots making a border at the top and bottom of the invite. A compass serves as a focal point to set off the name of the honoree. Designed by Star Stream Design. Nautical baby shower invitation with cute boats, waves and birds. 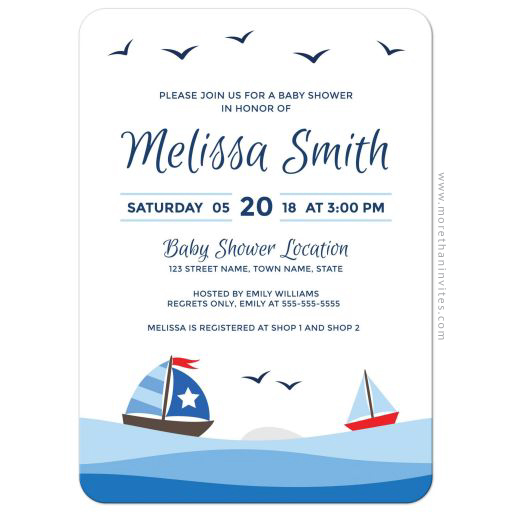 This nautical baby shower invitation features a coastal scene with two sailboats – one brown with blue sails with stripes and a star, and one red with light blue sails – on blue water waves. In the distance is a gray cliff and between the boats are two birds. There are also birds as a border at the top. Would be great for a nautical themed baby shower or a boat/sailboat themed baby shower for a girl or a boy. Design by MheaDesign. Nautical-themed baby showers are a fun way to celebrate the mother-to-be. This nautical-themed baby shower invitation features a navy blue striped background accented with small anchor icons. The main image is surrounded by a rope border with a background made to look like sand. A lighthouse shines its beacon across the text. A ship’s wheel is the focal point at the top encircling a baby’s pacifier. Other images include a sailboat, fish, telescope, lobster, seagull and a captain’s hat. The stripes repeat on the reverse. Set sail and batten down the hatches for the new arrival! Designed by Star Stream Design. Nautical baby shower invitation with blue anchor, sailing boat and rope border. 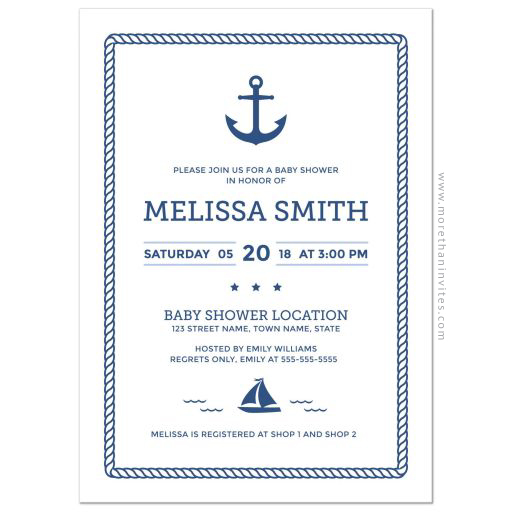 This modern nautical baby shower invitation design feature a dark blue anchor at the top and a little sailing boat with waves near the bottom. Along the edge is a rope border. The back of this contemporary and classy baby shower invite has diagonal, blue stripes. 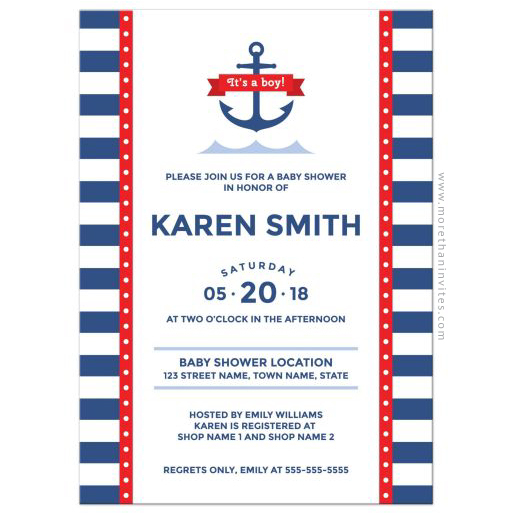 This baby shower invitation would work well for a nautical themed or an anchor themed / anchors ahoy baby shower, or for any boat, sailboat or ship themed baby shower and is only available through Lemon leaf prints. Designed by MheaDesign. 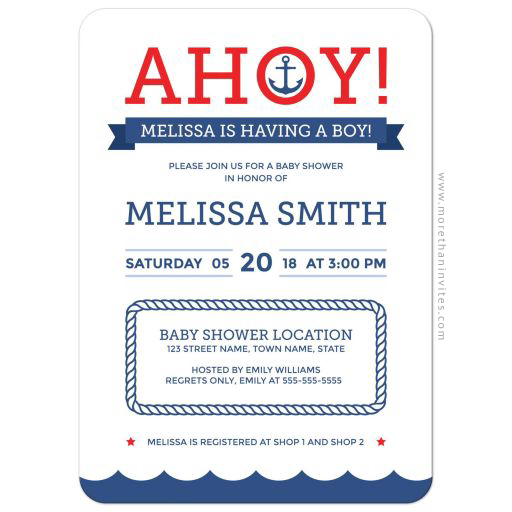 These baby shower invitations have a nautical, “Ahoy, It’s a Boy!” theme. It features two blue bunting banners at the top with a sailboat sailing at the bottom. There are some fish swimming in the water along with a whale. The customizable text is located in the middle. Designed by Jamene Designs. Nautical baby shower invitation with wide blue stripes and anchor. Designed by MheaDesign. 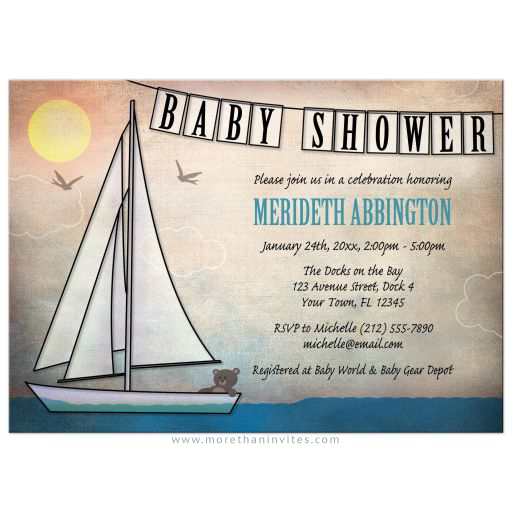 Rustic nautical Baby Shower invitations, featuring a rough illustration and line drawing combination of a sailboat on the water with a teddy bear passenger, and a “BABY SHOWER” banner on top. Designed by Artistically invited. 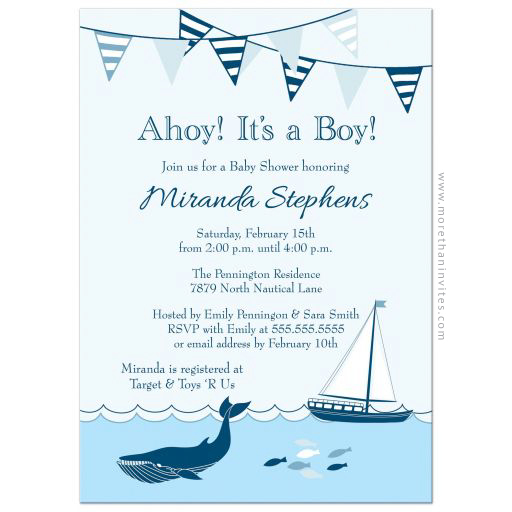 Darling sailboat invitation for your nautical theme boy baby shower! 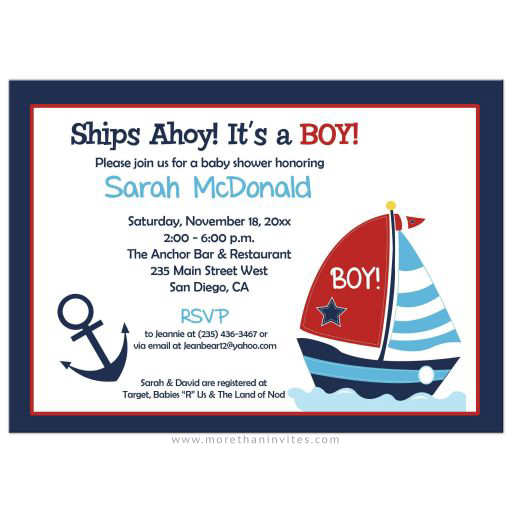 This invitation features a navy background with a sailboat with BOY! written on the sail! We have designed the invitation with a red, green, and navy blue color scheme, and a playful font that gives it a whimsical feel. Designed by Art by Jess. These baby shower invitations are a salmon pink nautical theme with a chevron pattern background. 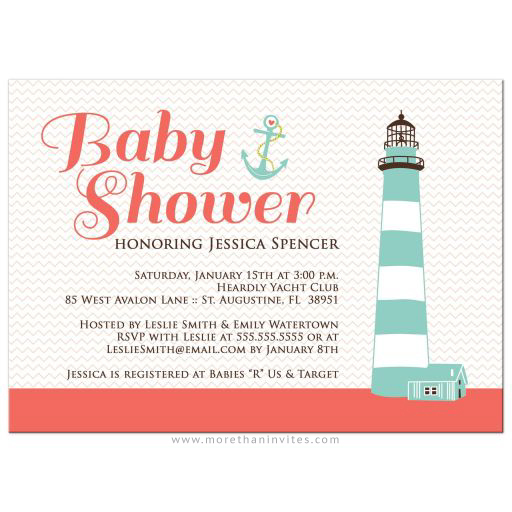 There is a lighthouse to the right and an anchor in the middle next to the baby shower party information. Designed by Jamene Designs..